Based on my time working in for a florist there is but one flower that can rival the almighty Rose as the favored token of love: the Peony. Interestingly, peonies are the most requested flower for weddings and are a symbol of fertility in western mythology and wealth and good fortune in the east. However in the Victorian language of flowers the peony says that the sender is too bashful (or ashamed) to admit their amorous feelings. 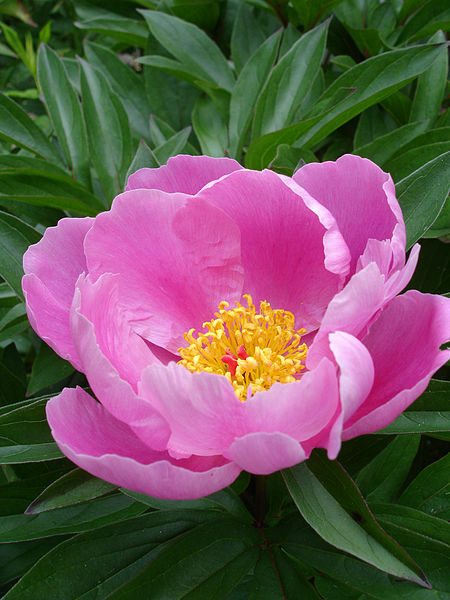 There are many different species of peony within the genus Paeonia but it is the Chinese (or White) Peony (Paeonia lactiflora) that is most commonly used medicinally. Traditionally, the root is prescribed for dysmennorhea (often in combination with licorice) and PCOS as well as premenstrual syndrome. It works by preventing prostaglandin F2 alpha production. Prostaglandin F2 alpha is a lipid compound that is created by the uterus that stops progesterone production when there was no implantation during the menstrual cycle. When prostaglandin F2 alpha binds to its receptors in the body it stimulates uterine contractions and menstruation begins. In some women, an excess of prostaglandin F2 alpha is made which creates more contractions of the uterus causing the pain associated with dysmennorhea and PMS cramping. Of course those uterine contractions can be taken one step further: white peony root has been used as an abortificient in both eastern and western medicine. So this Valentine’s Day, if you want something instead of roses for your beloved, consider the peony bouquet and you Brides to Be take note: nothing says love and romance like the contractions of the uterus.